New Delhi. September. Chairman Chiefs of Staff Committee (COSC) and Chief of the Air Staff (CAS), Air Chief Marshal Arup Raha inaugurated the Electro-Magnetic Interference (EMI) – Electro-Magnetic Compatibility (EMC) test facility and Near Field Test Range (NFTR) at Bharat Electronics Limited (BEL), Ghaziabad. The setting up of these state of the art testing facilities is a part of the transformation process of BEL into a major R&D and manufacturing centre of excellence in the critical field of electronic systems in the country for the armed forces. This will give fillip in developing and manufacturing products of superior performance and reliability with capability to operate in dense electro magnetic environment in the battlefield. 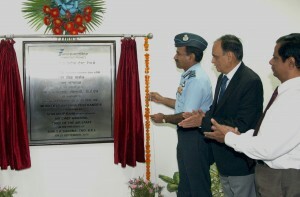 This event was followed by a visit to the key facilities, where Air Chief Marshal Arup Raha was updated on the ongoing projects. Bharat Electronics Limited (BEL) was established in Bangalore in 1954 under the Ministry of Defence (MoD) which manufactures a wide array of products in the areas of Radars, Electronic warfare Systems, Military Communication Systems, Weapon Systems, C4I Systems, Shelters, Electro Optics etc. BEL (Ghaziabad) specializes in design, development, manufacturing and production of Ground Radars, Antenna systems and Command & Control Systems.